This hooded scarf is made in two separate pieces. However hood is worked directly into the edge of the scarf in order to avoid having to sew another seam. The seam for this scarf falls on top of the hood. I would consider this to be a beginner pattern. It uses the extended single crochet stitch, which is very easy to do. The yarn used is Bernat Satin, but you can basically use any similar yarn. Bernat Satin or any worsted weight yarn. H/8-5.00mm or any hook suitable for the yarn. Adult small. Scarf length is 65″, width is 5.5″. 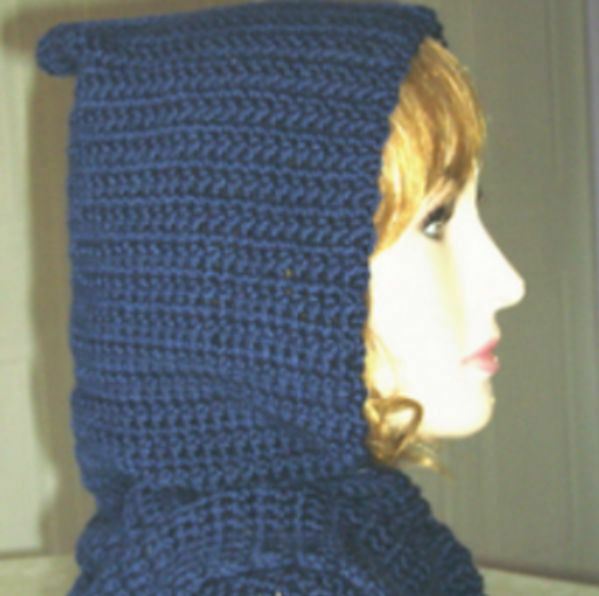 Hood when folded measures 12″ high and 8.5 inches wide on each side. However, you can increase the length of the scarf, as well as the width and length of the hood for a custom fit. Approximately 2″ over 6 rows, and 5.5″ across 20 esc. To make the esc: Insert hook in stitch indicated, yarn over and pull up a loop, yarn over and pull through one loop, yarn over and pull through both loops on hook.